The Creation Myth – Love. Life. Practice. After several pretty dark and sinister and deep-thought posts, it seems a good idea to lighten things up a little. Luckily, this is an easy day to do that: it’s the 24th anniversary of the day I took on one of the happiest, proudest, and most fulfilling roles of my life. I became a father, when my daughter Ashlei was born in Madison, WI. Ash is a remarkable young woman – a musician, a poet, an amazing cook, a mother, a political activist, an entrepreneur, and a fearless adventurer through life. She has taken leaps of faith and gone into situations that I would never have the guts for, and come out the other side stronger and wiser for it. This is the girl who created Irish sushi. Sausage wrapped in mashed potatoes wrapped in bacon. She’s the one who came up with the catchy title of my million-dollar idea for caffienated breakfast meat: Wakin’ Bacon! And while I can’t really share her lyrics on a family-friendly blog, suffice it to say the girl has some wicked rhymes. If it doesn’t show, I’m a little bit proud of her. There are a lot of words in the language to deal with the concept of my relationship with Ashlei. I am her father; I engaged in procreation (pro? I don’t remember getting paid for it!). Progeny. Spawn. Chip off the old block, fruit fallen not far from the tree. However, the biochemical reaction that resulted in the creation of a zygote sharing the DNA of myself and my then-girlfriend is less interesting to me than the twenty four years since then. What Ash and I have as Honored Father and Eldest Daughter has been something we’ve created together. Sometimes that creation seemed as painful as her birth, and other times it was so joyous that I felt my heart would burst. If there is one regret, it is simply this: I wish I had been more aware that we were creating this dynamic. It was many years before I recognized that I was creating the past in every moment, that I was creating the memories that would fill my head now, two dozen years later. I wish I had more conscientiously crafted the moments to carry forward with me. Except really, it’s a myth that we create our lives. Our lives happen; what we create are the stories we tell ourselves about why things happened the way they did. That’s ok; myths are useful things, and serve a purpose. It’s possible that it’s only a problem when we mistake the creation of myth with the discovery of fact. So that’s the habit I’d like to challenge you with this week: what is the myth you are creating about your life? Your relationships? What is the story you are telling? Can you change it? Maybe it would be fun to be the villain for a while…or maybe just a supporting character in someone else’s life. The fact is, every supporting character is a protagonist in another story ( I’d recommend the “Ender” trilogy followed by the “Ender’s Shadow” books – Orson Scott Card does a great job illustrating this concept). Keep in mind that whatever role you choose to take is just that: a role. 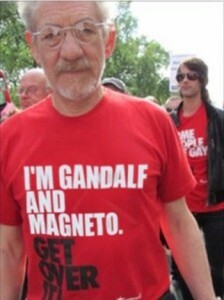 You are yourself, regardless, just as Sir Ian is both Magneto and Gandalf. But he’s also Ian, regardless of the lines people have him say. At some point, the purpose of recognizing the roles you play is so that you can figure out what that person is underneath them. I bet that, like Ashlei, you’ll be amazed at just how remarkable that person is. Thanks for the emails and comments of support, by the way: TJ, Poetic, Danielle, Diana and Jay, especially. It’s good to know this project is helping somebody other than myself!